I chose Morocco as my theme for my Cultural Identity and Commercial Interior Design Project. I had been there on a recent trip and found the country to be rich and vibrant. It plenty of medieval-like architecture, vibrant colourful designs and unique mosaic art which I wanted to incorporate into my own design. Here are a selection of photographs I took while I was there. I began my project by researching aspects of Moroccan culture such as the architecture, colour palettes, mosaic tiles, Islamic art & furnishings. I managed to source plenty of images of these different aspects of Moroccan design. Below is a selection of some of my favourite images I came across. As well as looking at different aspects of Moroccan culture I also looked at different types of cafe designs for inspiration. I especially looked at cafes and restaurants associated with certain cultures and how that was conveyed in their design. I also looked at other aspects such as lighting and ambience for creating friendly and relaxed atmosphere, unique furniture ideas and colourful features. After the research stage we went to visit the cafe in St Andrews as a class trip. Here are some photographs of the cafe we were to redesign. Next I started on the development stage. I started to think about how I would design the layout of my cafe. There were obviously some things I had no control over such as where the kitchen, toilets and fire exits were located. However I could set out the seating and serving counter any way that we liked. The back area of the cafe was raised so I would need to incorporate a ramp for wheelchair users. I was also required to have seating for at least 40 people. 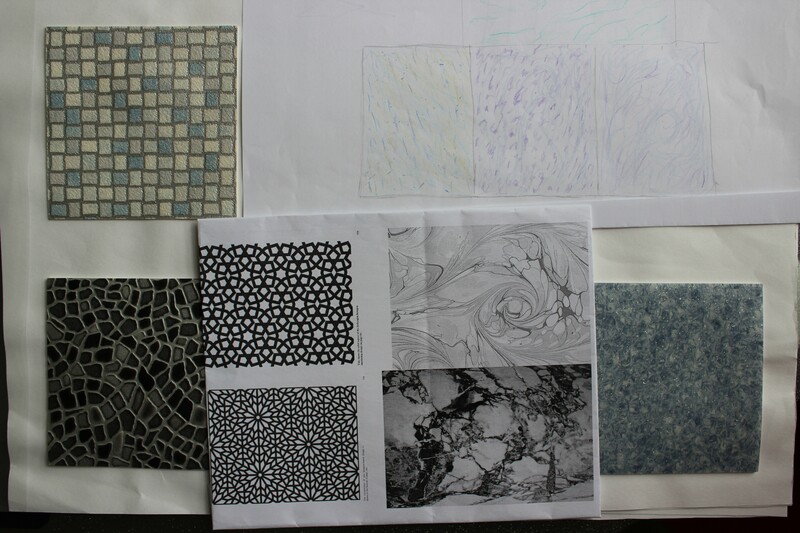 Materials I could use in my cafe design including marble flooring, mosaic tiles & Islamic patterned screens. For my initial design concept I decided to incorporate marble, Moroccan style screens and mosaic tiles in blue and white for a nice airy feel. I also thought of using metal patio style furniture for a more exotic outdoors look. First Design Concept using pale marble flooring in public area, tiled in kitchen & serving area behind curved counter and blue patio style furniture seating. I tried out a contrasting design being very colouful with dark wood and lots of detail including hanging lanterns, Moroccan style arches and Islamic patterned screens. The cafe would be mainly made up of booth seating areas, have wooden floors at the rear and blue mosaic tiled floor at the front. Material furnishings would be deep red and purple to add some rich vibrancy. 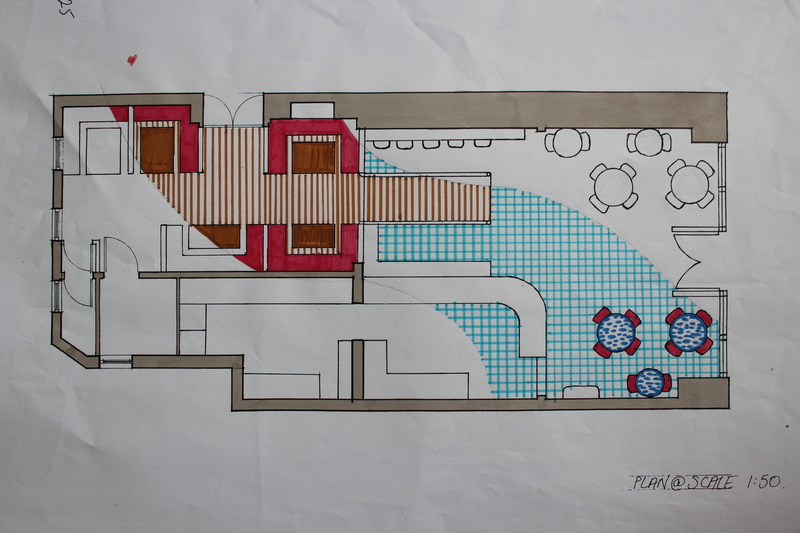 Design Concept 2 Plan View with wooden floored booth seating area towards the back of the cafe, counter seating area around the ramp up to the back area and some booth and table seating areas towards the front of the cafe. The front of the cafe would have blue Moroccan style tiled floor and large rectangular serving area to the side of the kitchen. 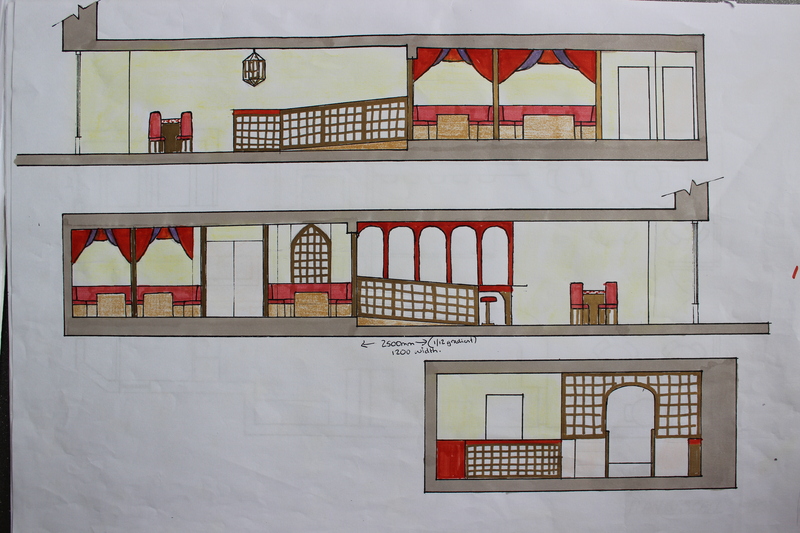 Design Concept 2 Section Views which show the golden sandy coloured walls, dark wooden trellises and arches, deep red fabric furnishings, hanging lanterns and colorful Islamic art style mosaic border detail. I felt that my first design was too pale and my second design was too over powering and cluttered. Therefore for my final design I decided to go more down the middle road. I liked many aspects of my 2nd concept but it needed toned down a bit. I had decided to keep the booth seating area at the back with the wooden floors. 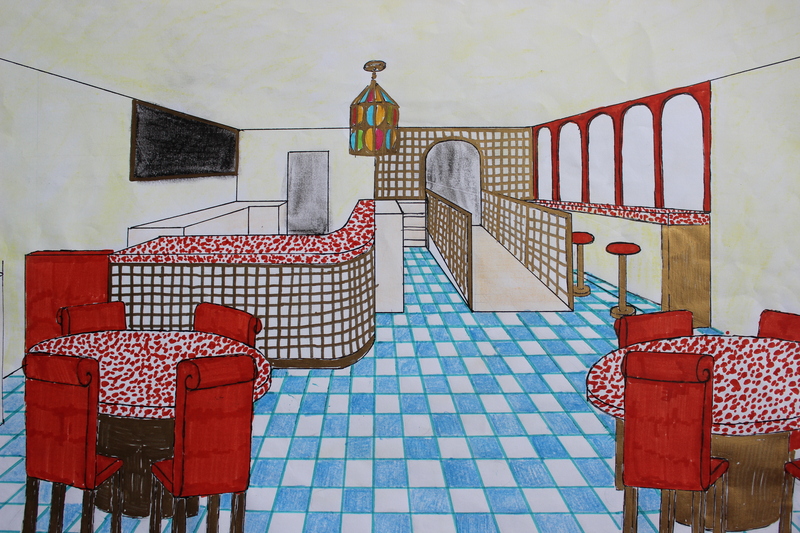 The front of the cafe had a paler blue mosaic tiled floor and cafe style furniture. I put in a curved counter area to the side and had some raised bar seating either side of the ramp. This would give customers plenty of choice of what type of seating they would like. I replaced the dark wooden Moroccan screens and arches with gold ones to add a touch of elegance to the overall design. 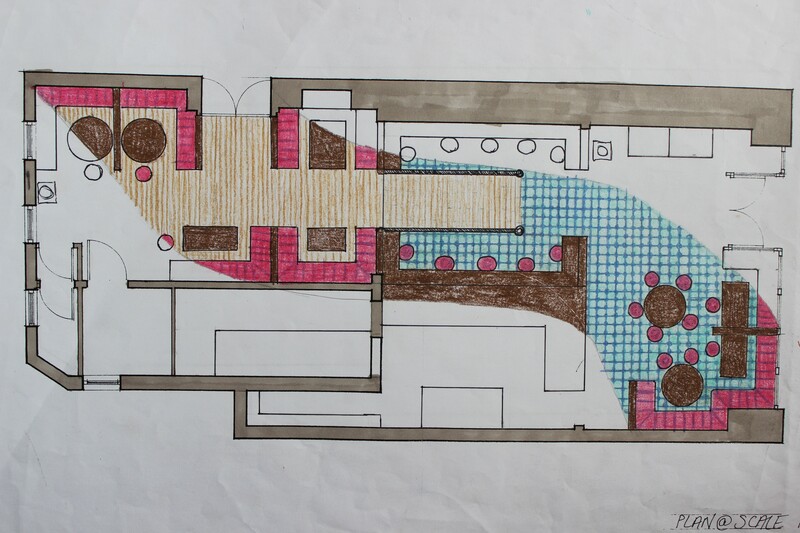 Plan View of Final Design Concept. Toned down from last design with a lot more white and also mosaic table tops. 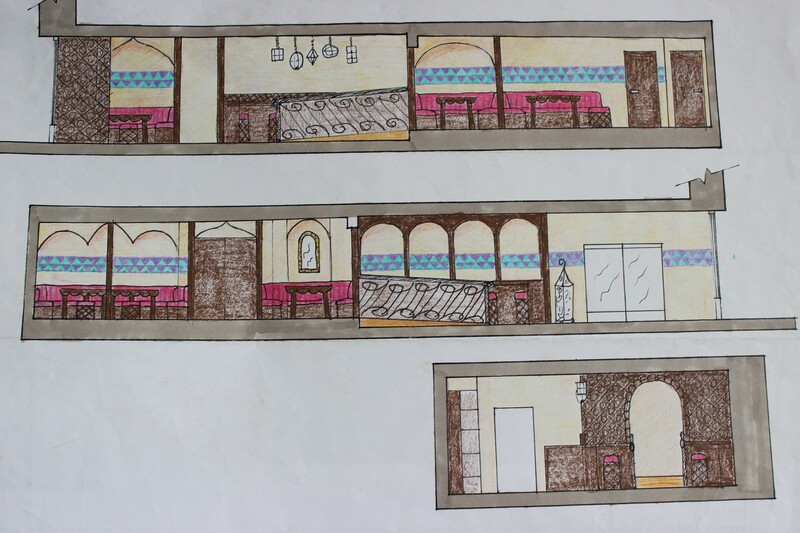 Section Views of Final Design Concept with gold Moroccan style screens to section of quieter booth seating area to rear and also as a unique design on the front of the counter. I then went on to to draw up my Final Design using Google SketchUp. Below are the final views of my finished design.